PORSCHE APPROVED CERTIFIED PRE-OWNED EXTENDED WARRANTY! 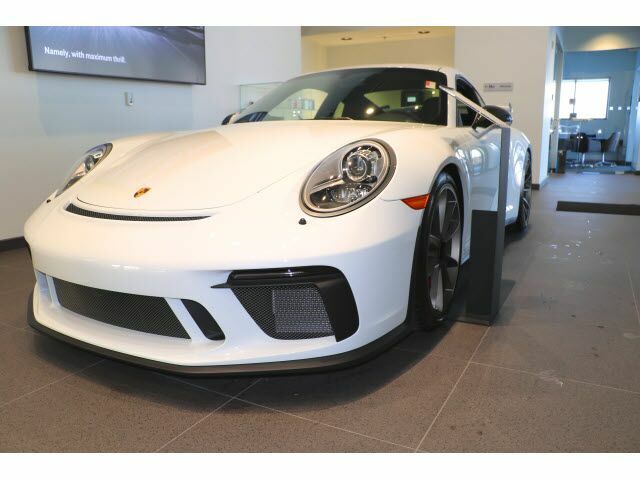 Low-Mileage, Local 1-Owner 2018 911 GT3 we sold new in Carrara White Metallic over Black Leather/Alcantara. 3-PEDAL GT SPORT MANUAL TRANSMISSION car. Front Axle Lift System, Light Design Package, Smoking Package, Leather/Alcantara Interior Package with Contrast Red Stitching and Seat Belts, BOSE Surround Sound System, Sport Chrono Clock Dial in Guards Red, Carbon Fiber Interior Package, Voice Control, Sport Chrono Package with Porsche Track Precision App, Wheels Painted in Platinum Satin, Instrument Dials in Guards Red, Sport Design Exterior Mirrors Upper Trim in Carbon Fiber, and More! Please Contact Brian Stacy 1-855-979-0255 to Test Drive Today! Aristocrat Motors, Kansas City's premier luxury dealer strives for the highest levels of customer service. Voted "Best in Business" by the readers of Ingram's magazine, our customers are our number one priority.